L-R: Dan Farrow, Alasdair Purkis, Joe Rowntree and George Musson all took part in Framework’s annual fundraising event, The Sleep Out. 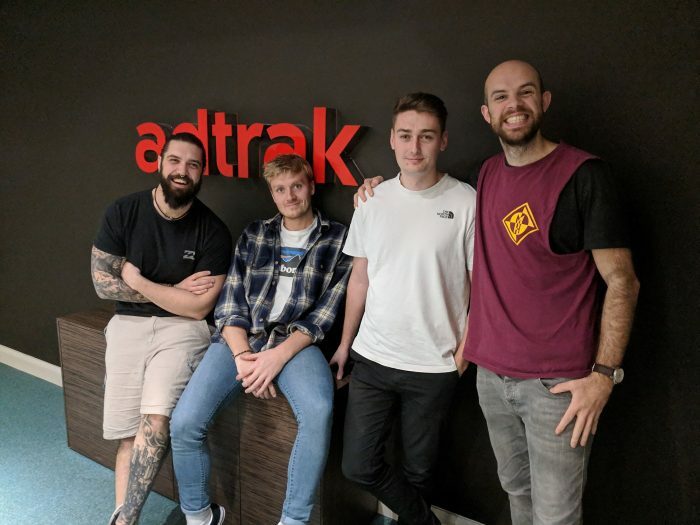 Nottingham-based digital marketing agency, Adtrak is ramping up its fundraising efforts – announcing that it will be supporting local homeless charity, Framework throughout 2019. Recently four team members – Senior Manager, Dan Farrow, Assistant Head of Internet Marketing, George Musson, Internet Marketing Consultant, Joe Rowntree and Photographer, Alasdair Purkis – took part in Framework’s annual fundraising event, The Sleep Out. Holly Shackleton, Operations Director at Adtrak said: “As a city centre business, every day we see those affected on the streets of Nottingham and after meeting with Framework and gaining a greater understanding of how they provide such valuable services to vulnerable people in the city, we were glad to choose Framework as our official charity.